News Item: That looks good! Hadn't decided what to make for dinner tonight, and it was getting late. Something light was in order - I really wasn't that hungry if I'd waited so long, right? Well, as I was flipping through the channels a commercial for that copper pan came on - you know the one nothing sticks to it, never scratches... It's that lady who did the "dump" cookbooks? Well, when she got to that tortilla thing, I gotta admit it looked just right! 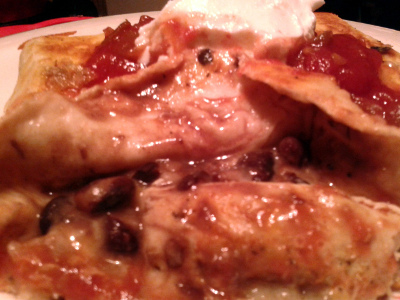 Some leftover chicken breast coarsely sliced, seasoned black beans straight from the can, a generous sprinkle of cheese... Folding it wasn't quite as easy as she made it look (maybe because I'd already started to heat the pan), but it came out fine. 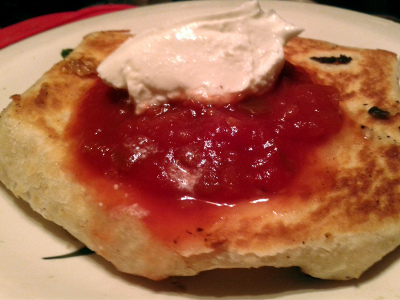 Topped with a splash of salsa and a dollop of plain greek yogurt?